Sturbridge is giving some thought to the future planing and building of neighborhood developments. This is a good thing. Not many communities put in the hours discussing mundane subjects such as this. A developer applies for a permit, or two, plans are reviewed, changes made to conform with the existing town bylaws and regulations, and abutters are included in the decision making. Then, after a year or so they have a cul-de-sac with ink stamped colonial homes on 1.5 acres of land, a few trees in the front, a unusable forest in the rear, a sidewalk, and streetlights. Well, it might have been in 1964. The ideas Sturbridge are working on is to have developers plan more in depth to include open space in their design, cluster housing, and recreational space. There is a lot more details to the idea than what I have just mentioned, but the you get the idea--to use the land differently for the benefit of all. Back a couple of hundred years ago a neighborhood started in the center of a town. Merchants lived above their shops, or around the corner from them. People built homes near where there was work to be had, such as around mills, and factories. Farmers were the only people that didn't live in a neighborhood. They lived away from the center of town, their homes centered on their large plots of land, and they came into town when ever they needed supplies or to attend church. Eventually the neighborhoods expanded outward from the center as more people arrived in the town. It was good to stay close to Main Street since everything to be had, like stores, and churches, was within walking distance. This is the neighborhood model that existed until just after World War II. After the war there had to be houses for all the returning veterans, and there just wasn't enough of them. 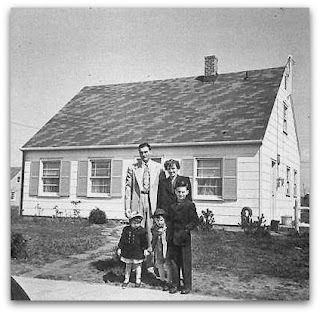 With the development of Levittown on Long Island, the modern, cookie cutter housing development was born. Similar houses, on similar plots with similar landscaping all connected by looping roads that led only further into the development with usually only two ways out to the main road. This was Pleasantville. I grew up in such a place. I thought nothing of it back then. It offered space to play in, neighbors close by, and the uniformity of the houses lent a sense of belonging. Today, more thought needs to be placed on the designing of housing developments. Elsewhere in the country they are being designed, and built in clusters with less land for the individual homeowner, and more for ball fields, playgrounds and passive open space. Land is preserved, and sensitive land is conserved without adversely affecting the neighborhood. Some developments have small stores built within them which is not only a convenience for the homeowner that is 3 miles from town and out of milk, but is a green initiative, too, since the homes are all walking distance to the store. It may be a bit too early to fairly judge the plans Sturbridge has in mind since they are still in development, but its good to know that the town is heading in a positive direction regarding housing developments. With so much land available here in town for development, it is important that the very most be made from it not only for the benefit of those that will live there, but for the rest of the town as well.